Contest ends March 1, 2019, at 3 p.m. TEGNA., Inc., respective affiliated companies, and advertising and promotional agencies, and the immediate family members of, and any persons domiciled with, any such employees or contractors, are not eligible to enter or to win. 3. How to Enter. The Sweepstakes will begin 01-11-19 at 8:00 a.m. (C.T.) and ends on 02- 22-19 at 3 p.m. (C.T.) (“Sweepstakes Period”). The entry deadline is at 02-22-19 at 3P p.m. (C.T.). Entries received after such time any day will be included in the following weekday’s drawing. 4. Winner Selection. 1 winner will be selected on 02-22-19 at or about 3:00 p.m. (C.T.) during the Sweepstakes Period from among all entries received that day. 6. Winner Notification and Acceptance. Sponsor will call during regular business hours at number provided on entry form and will leave no messages. Failure to reach winner by phone after three (3) attempts may result in disqualification of winner, forfeiture of his or her interest in all prizes, and selection of a substitute winner from among all remaining eligible entries. 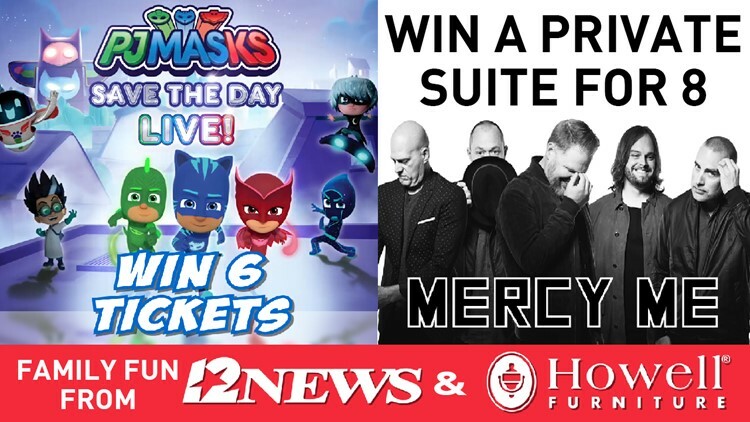 To claim prize, each winner must personally visit the 12News studios located at 525 I-10 south Beaumont, TX within five (3) business days after notification. Office visits must be weekdays between the hours of 9:00 a.m. (C.T.) and 5:00 p.m. (C.T.) A valid photo identification may be required. Winners may waive their right to receive prizes. Prizes are no assignable and nontransferable. No substitutions allowed by winner. Prizes are not redeemable for cash. Prizes and individual components of prize packages are subject to availability and Sponsor reserves the right to substitute prizes of equal or greater value. Winners are solely responsible for reporting and payment of any taxes on prizes. Winners may be required to complete an affidavit of eligibility/liability and publicity release (except where prohibited by law) which must be returned as directed by Sponsor. Failure to sign and return the affidavit or release, or to comply with any term or condition of these Official Rules, may result in a winner’s disqualification, the forfeiture of his or her interest in the prize, and the award of the prize to a substitute winner. Except where prohibited, acceptance of any prize constitutes winner’s consent to the publication of his or her name, biographical information and likeness in any media for any commercial or promotional purpose, without limitation the Internet, or further compensation. Prizes not won and claimed by eligible winners in accordance with these Official Rules will not be awarded and will remain the property of Sponsor.